Ames balances the best of small-town living with big city opportunities, and others are taking note. In 2010 CNNMoney ranked Ames #9 in the Top 100 Best Places to Live and in 2007 it was picked as one of the nation's 10 Best Places to Retire. The city's commitment to innovative and sustainable practices landed it on Mother Earth News' third annual Great Places You've Never Heard Of list in 2008, one of only nine communities honored. Ames' innovative Resource Recovery System as well as the mix of cultural and educational activities available were two reasons Ames was cited. 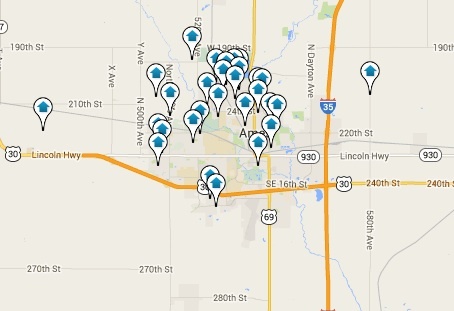 Ames has 33 parks offering a variety of recreation opportunities. This includes Ada Hayden Park featuring hiking and bike trails, hundreds of acres and prairie, and boat access to the 130-acre lake. More than 28,000 students are enrolled at Iowa State University, the school best known for its landscape architecture program. Located on campus is Reiman Gardens, a 14-acre year-round site featuring a 2,500 square foot butterfly wing. The Iowa State Center brings world-class performing arts to Ames and houses the Brunnier Art Museum, and sports bring another level of excitment to the area as the ISU Cyclones compete in the Big 12 in football, basketball, wrestling, and more! Other major employers include Iowa Department of Transportation, Mary Greeley Medical Center, McFarland Clinic PC, and Sauer-Danfoss, a company that works with off-highway vehicle manufacturers.